The Minnesota man suspected in the murder of a Madison resident has been identified. 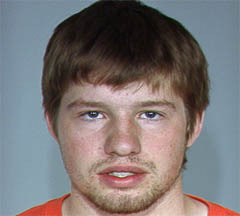 Adam Peterson was sophomore at UW-Madison until he dropped out last October, according to his father Melvin Peterson. Peterson says his son appeared "troubled" when he moved back home to his mother&apos;s house near Stillwater, Minnesota, in March. The 31 year old victim, Joel Marino, was stabbed inside his home near downtown Madison in January. He died in an alley while attempting to reach a nearby hospital emergency room. Peterson was arrested Thursday night. His father believes the crime was purely random. Madison Police Chief Noble Wray says a charge of homicide is being filed against Peterson.